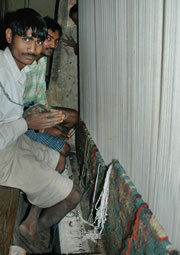 Zamin rugs are hand woven in villages in the eastern region of India's Uttar Pradesh state and Bihar state. The word 'Zamin' means earth or land in Persian and Hindi. These unique and wonderful carpets are constructed utilizing only the best materials and techniques. 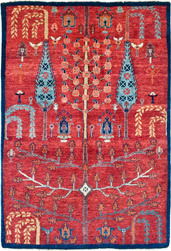 Woven using all natural dyes and hand spun, hand carded wool, Zamins are truly carpets of the earth. 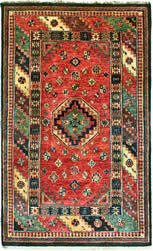 They are a thick, weighty, tough carpet, similar to old Persian Bijars. Rich and saturated jewel tone colors typify these masterpieces. Zamin designs vary greatly, ranging from modern to classical Persian designs, as well as more primitive designs like Persian Gabbeh. Only the best and longest New Zealand staple wool, which is hand carded and hand spun, is used. It is then dyed with all vegetable dyes gathered in India and Nepal. Relatively finely woven, Zamin's typically have a knottage of 101 or 180 knots per square inch and range in size from 2'0 x 3'0 to 10'0 x 14'0. Proceeds from the sale of these rugs support Barakat Inc and their efforts to provide education and health care to the people of Afghanistan, Pakistan and India.